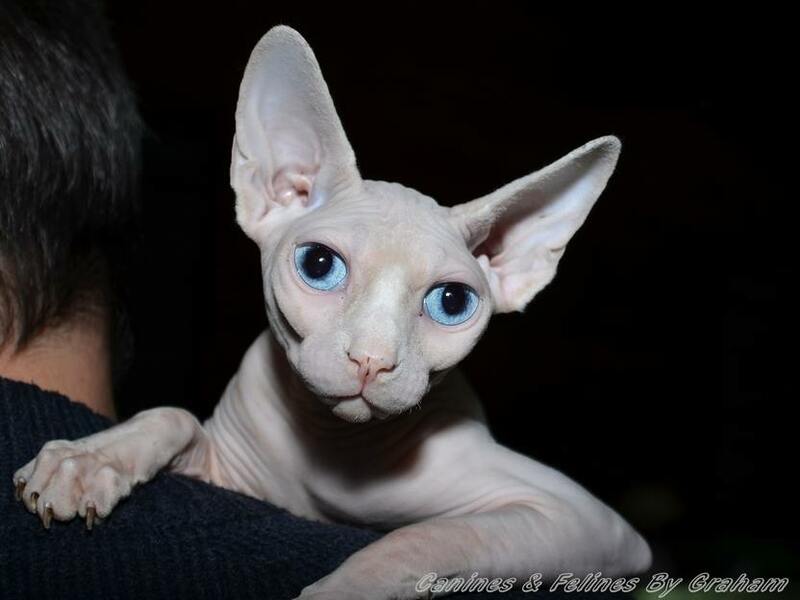 How would you like an in depth look at the Sphynx cat breed profile from an expert? You've always been curious about Sphynx cats and just want to make sure the breed is right for you before trying to find a kitten. You have a few questions, maybe even a few concerns . . . So as a GCCF cat judge and huge fan of Sphynx I am sure I can help. Let me introduce you to the amazing breed of Sphynx cats. The Sphynx cat is an instantly recognisable breed of cat all over the world, being characteristically hairless. Sphynx cats and kittens truly are the marmite of the cat world, you either love or you hate this breed of cat. Once you get to know a Sphynx, however, it is hard not to fall in love with them due to their dynamic and mischievous personalities. Sphynx cats need to be kept as indoor only cats as they are extremely sensitive to heat, cold and humidity. Many people mistakenly believe that Sphynx cats are a good breed of cat to keep if you suffer from allergies, but this is not the case as it is the cat’s dander (dead skin), saliva and scent glands that often cause allergic reactions in people. 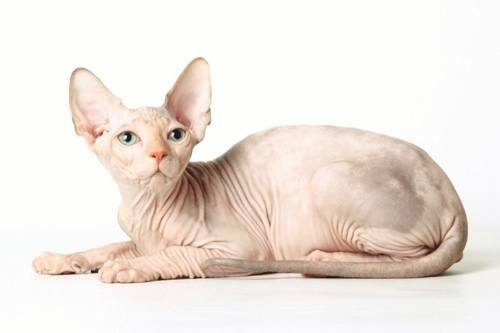 The hairless gene is a result of a natural genetic mutation and as a result hairless cats have appeared all over the world and at different times in history. In Canada in 1966, a hairless kitten named Prune was born and it was from him that more hairless kittens were produced. As hairless cats occasionally appeared naturally all over the world, cat breeders in Canada, America and Europe worked with these hairless cats to create the Sphynx cat as we know it today. 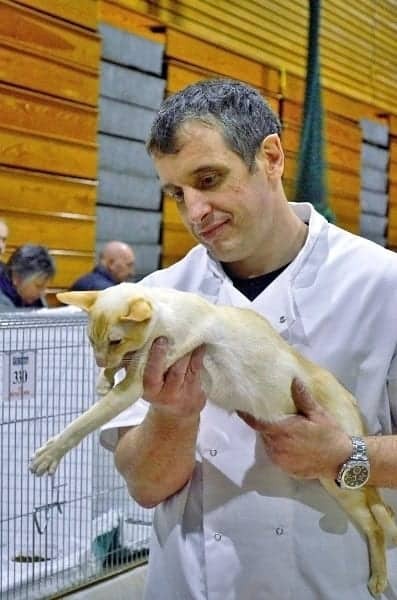 Naturally occurring hairless cats were crossed with domestic shorthairs and Devon Rex cats to try and keep the gene pool large and reduce the risks of inbreeding. Sphynx cats are a medium sized breed and are fairly muscular with medium sized bodies and a broad chest. Their legs are in proportion with the length of their body and they have a fairly long, whippy tail, which is sometimes referred to as a ‘rat tail’. They have an angular, exotic looking head with very large, lemon shaped eyes and very large ears. Sphynx cats are not strictly completely hairless, instead having a fine coat of down making the Sphynx feel somewhat like a warm, fuzzy peach to the touch. A Sphynx cat may have a few limited hairs on their face, paws and tail. Their skin is wrinkled on their legs, body and head. Sphynx cats and kittens come in all colours and patterns, with black Sphynx appearing dark grey and white Sphynx appearing pink. Because the Sphynx does not have fur to absorb body oil, they must be bathed frequently. Sphynx cats have a fast metabolism and so eat more than other breeds of cat. They also need to poo more! It may go without saying that Sphynx are no ordinary cat! And this does not just account for the way they look as their personalities are as extreme as their appearance. Sphynx cats are lively and playful well into old age, and are well known to be mischievous little trouble makers. They become very possessive of their people and are extremely outgoing and affectionate. This breed of cat just will not be ignored and must be close to their people at all times. If you cannot give your Sphynx attention every minute of the day then it is advisable to get your Sphynx some company in the form of another cat as they are very friendly towards other pets as well as people. If you want to live with a Sphynx cat then be prepared to be followed around constantly. A Sphynx cat will do anything to get your attention and is always prepared to help out with whatever you are trying to do! "﻿Don't make the mistake of thinking because they are hairless they are hypoallergenic. If you have allergies, these cats can make them worse because they produce dander (dead skin). " Sphynx cats and kittens are very sensitive to heat and cold and must be kept out of direct sunlight as they burn much more easily than other breeds of cat. To help keep them warm they need to be fed a high calorie diet. As Sphynx cats sweat, they need to be cleaned with a damp washcloth at least once a week to keep their skin clean and oil free. Their ears also need particular attention as they produce a lot of wax and need to be cleaned on a regular basis. Remember to check your Sphynx’s teeth regularly to make sure they are healthy and free from disease. As with other breeds of cat, keep your Sphynx’s claws neat and well trimmed. Whilst a well bred Sphynx is generally healthy, all breeds of cat have the potential to develop hereditary health conditions and diseases. Whilst responsible breeders are striving to breed healthy kittens; it is advisable to get your Sphynx checked over regularly by a vet (as you should with any breed of cat), especially if you notice any problems. Like many other breeds of cat, Sphynx have been known to develop hypertrophic cardiomyopathy (HCM) a disease affecting the cat’s heart muscles. Sphynx may also develop a rare, but eventually fatal, neurological disease; hereditary myopathy. This disease affects the cat’s muscles and the cat will eventually be unable to swallow. Skin conditions, such as urticaria pigmentosa and cutaneous mastocytosis. Below are some Sphynx cat pictures including examples of most of the different colours of Sphynx cat. Please feel free to contact us if you would like to contribute any photos of your own Sphynx cats and kittens, we would love to include them! How long do Sphynx cats live? Life expectancy of a Sphynx cat is generally good with reported lifespan of 9-15 years. Do Sphynx cats require grooming? Surprisingly because they have no fur the answer is yes, Sphynx cats do require grooming. The body oils build up on their skin, on other cats these oils are absorbed by the fur, so the Sphynx cat needs regular baths. What does a Sphynx cat feel like? The best way to describe how Sphynx cats feel is they are like a warm chamois leather. They are soft, smooth and warm. They also have a very fine downy fuzz of fur and so feeling a Sphynx cat is also sometimes likened to touching a warm peach. Can Sphynx cats go outside? They are very vulnerable to the elements and can easily get sunburned. They are also unable to cope with the cold. So it is fair to say that the Sphynx cat is an indoor only cat. Here are a few of the most useful resources I am happy to recommend. Ross writes extensively about cats and kittens and has been featured in magazines such as Your Cat and Our Cats and has also guest authored on newsletters for various cat organisations. He is also a guest speaker at cat seminars.